Easy and fun to use as it focuses only on one topic: you. It instantly presents you with all of it's possibilities with example pictures and all you have to do is apply them to your pictures. Don't let a bad picture, stain a perfect moment. 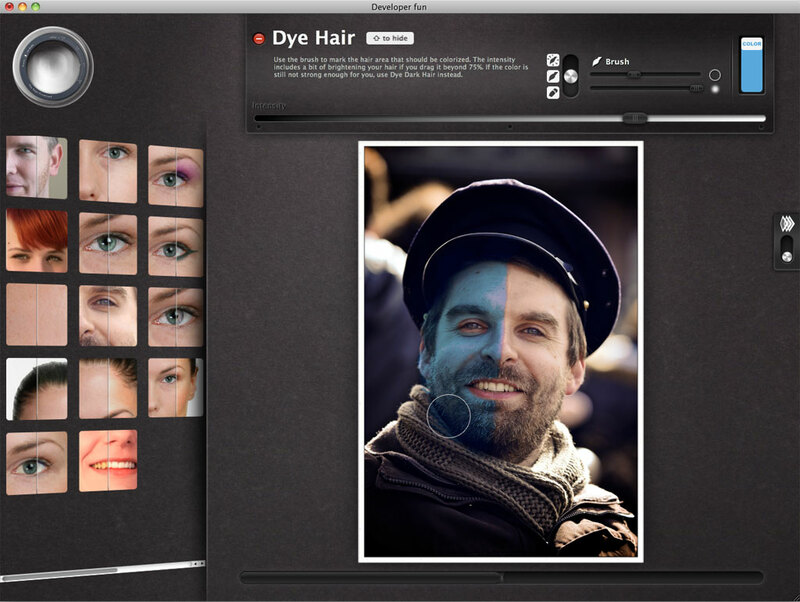 PhotoDazzle: Beautifier has a highly complex engine built on top of Apple's Core Image technology. Sadly we discovered some pitfalls too late but them are fixed in the last release! If you are still experiencing problems, please let us know. We will fix your issues as soon as possible! — Thank you! Photo editing without any knowledge can be this easy. Look your best, look super health with impressive eyes, perfect teeth, hair and skin. Never again hide a picture because you did not look your best. Quickly try out dozens of lipsticks, eye shows, rough colors, hair colors,… Find your own look. Powerful effects at your finger tip without complexity. Imagine a brush that knows what you want to do and supports you while doing it. Want to work on small details? No problem with a simple to use loupe. Simplicity, so that you can concentrate on the task. 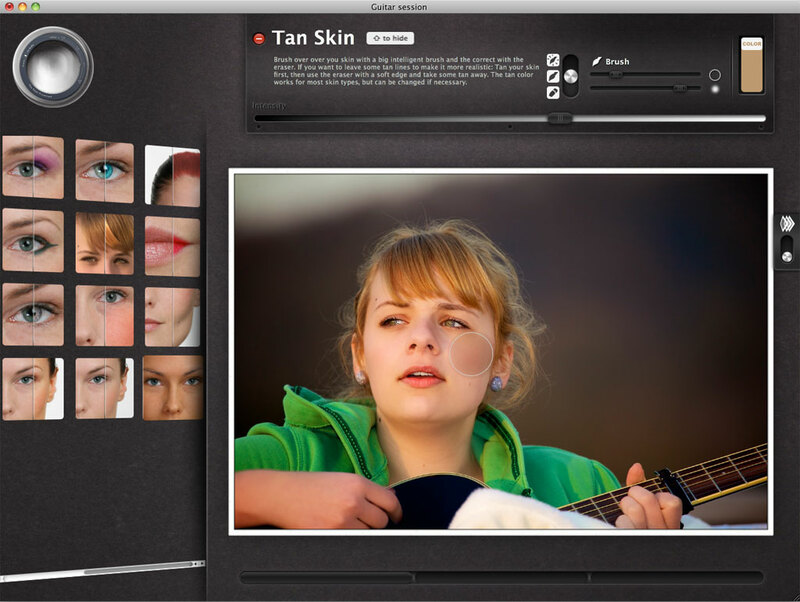 Special features that make PhotoDazzle: Beautifier unique. Apply an effect the way you want it. The magic brush supports you while editing. It knows the effects and where they should be applied and most importantly how. Overdone an effect? Simply remove some parts with the eraser. Simply click on an object and PhotoDazzle will do the rest. Working on details is easy with the simple to use loupe. Layers can be shown in 3D so that you can see which effects are applied and in which order. PhotoDazzle uses Core Image to boost the performance. Photo editing do not need to be complex. PhotoDazzle contains special knowledge so that you do not have to deal with detail and overloading controls. PhotoDazzle deals with multiple picture formats. There is no need to use a different program for a special file format. PhotoDazzle uses multicore architectures for its real time editing. Any effect and tool is well documented inside the user interface. PhotoDazzle is a 64bit application. Don't know anything about layer handling for photo editing? PhotoDazzle takes care about all the details. PhotoDazzle is ready for Lion and therefore prepared to be a fullscreen application. 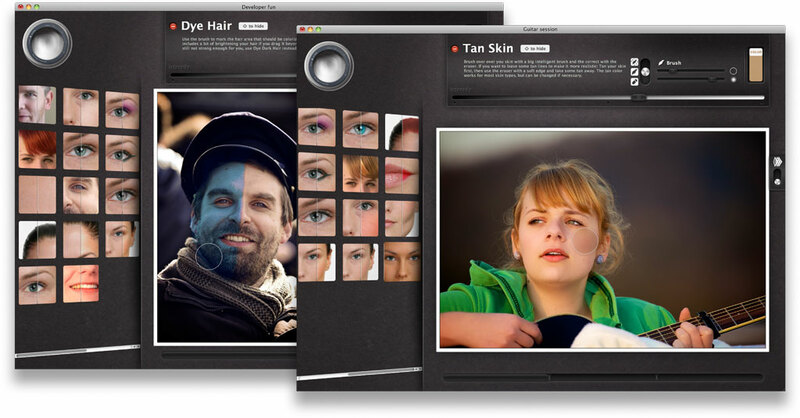 PhotoDazzle is multi-document based. You can handle several pictures at once. Usually PhotoDazzle cares about a number of details. If needed you can precisely edit the effect appearance. Photo editing usually requires a lot of steps. With PhotoDazzle it is just one. Fast switching between before and after effect apply enables easy comparison of the effects appearance. Powerful effects at your finger tip. Simply lets you add some beard to your face. While in the business world being shaved is key, the 3-days-beard has gained its place in the last decade. It can stand for coolness or simply show that you are too busy to think about shaving. Dyes dark hair or parts of it, in any color you want. You can simply try out a color without harming your real hair or color-match your hair with your cloths or eyes. Eyeliner creates the famous cat-like look. The contrasts around the eyes strongly increase the impact of the eye themselves. Eyeliners are no longer just black, while they still stay dark colors you can slightly match the colors, your iris or make-up. This tool allows you to apply eye makeup. A clear eye-white with no yellow touch and not too many arteries is a sign of health and draws attention to your look. With this effect you can decide yourself how white your eyes look. If you just want to reduce yellow and red colors or even if you want them more glowing in the dark. Dyes bright hair or parts of it, in any color you want. You can simply try out a color without harming your real hair or color-match your hair with your cloths or eyes. Hair highlights increase the impact of your hair and makes it look more interesting. Adding highlights on a photo is not an easy task as you want to only colorize a streak of hair, but its impact is quite worth it and once your are done you can use any highlight color you can dream of. This effect might also help you cover up some showing roots. Shine hair makes your hair look brighter and fresher. Especially dark colored hair easily looks too matt in photos, shine hair increases the highlighted areas in the hair thus making it look fresh and silky. Try it on your hair and see with which intensity your hair looks the most attractive. Allows you to add light reflections to your skin, where there are none. When your picture looks as if there was no sun, because the skin tone is too equal over the picture, this effect allows you to add light reflection points to your skin. 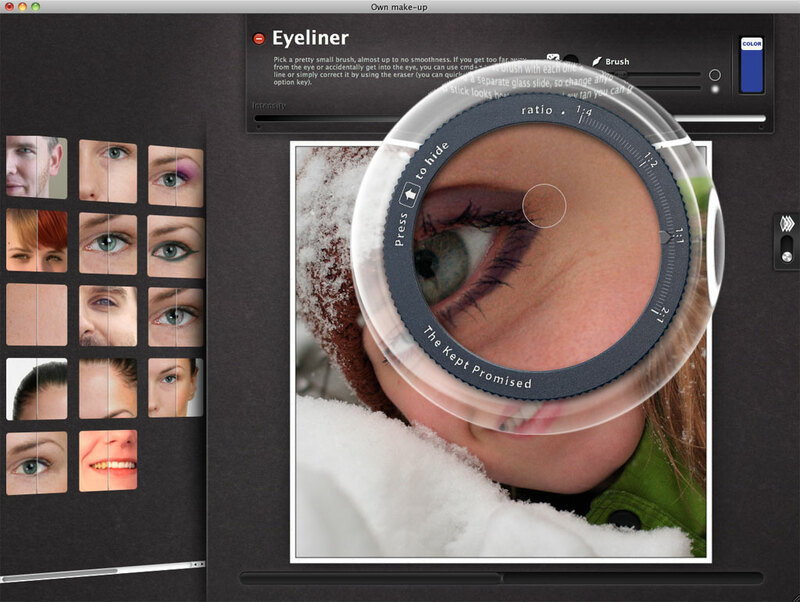 Colorize Iris is like a colorized contact lens that gives you any iris color you want. Enjoy the fun of an endless variety of iris colors, even if you just want to make them match your shirt. Enhance Iris gives your eyes more impact by increasing its contrasts without changing the color. The eyes are a central element of our look, iris coloring and impact are crucial. Some doctors even use the iris for diagnostics. You have the chance to give yourself back what light and environment had taken away from a strongly contrasty iris. Draw attention to your lips by giving them the right color appeal. While for a long time lipstick was about having the perfect red, these days everyone has their very own color, from color matching your blouse to showing attitude. Remove Small Blemishes is a specialized brush to cover up single spots on your skin that you don't like. It will be covered up with a patch of skin. The dream of many, a brush that removes any wrinkle.You can either remove any wrinkle completely or just dim it, the intensity is up to you. If you have a dark iris and still want to colorize it you will have to place an iris with strong contrast over the current one. Replace the iris with this effect first then place a colorize iris above this effect. Use Rouge to make your face look more alive, the slight red on your cheeks simulates blood flow. The colors used for rouge are no longer only the realistic red, they vary up to a rose to achieve a doll-like look. You can use rouge to fix pictures that look too pale or increase the intensity if you want to draw attention to your cheeks. Rouge also effects the shape the face seems to have. If you use rouge more horizontally the face seems to be wider, while a vertical extent tends to make it narrower. A shadow gives the face a different shape and is normally used to make the face seem thinner. A typical usage is right under the cheek bones to give the general face a thinner look. You can, of course, use it at any place where you want the illusion of a bone casting a stronger shadow. Shine Skin is used to increase the intensity of already existing shine point of the skin, to create the illusion of a brighter sun light. This more modern and still rare model effect gives your skin a bright shining tone. This effect is to use on your whole facial skin and can even be combined with the Soft-Skin-Look effect. Give it a try, it might seem awkward while putting on, but compare the before/after when you are done. This is a classical effect from professional photo shoots. It makes the skin look super smooth. The soft-skin-look softly removes all dark spots like pores, makes freckles look softer or even has them disappear and lessens wrinkles. Use this with care if you want to keep a natural look. Give you skin some tan. On photos bright light can easily make skin look too pale or your skin looks too pale in general as there was simply no sun last summer. This makeup gives your skin the tan you want. For Halloween you can even try out the Hulk look. White teeth are considered to be the most beautiful and create the most attractive smiles. While we know today that slightly yellow teeth are the more healthy ones, we sometime have pictures where they show too much shadows. This effect whitens your teeth and brightens them at the same time. Is your favorite effect missing?Suggest it!